Rag Radio with Thorne Dreyer features hour-long in-depth interviews and discussion about issues of progressive politics, culture, and history. The show is produced in the studios of community radio station KOOP-FM in Austin, Texas, in association with The Rag Blog and the New Journalism Project, a Texas 501(c)(3) nonprofit corporation. Rag Radio airs — and streams live — on WFTE 90.3-FM in Mt. Cobb, PA, and 105.7-FM in Scranton, PA. every Sunday from 10-11 a.m. The show is originally broadcast on KOOP 91.7-FM in Austin on Fridays at 2 p.m. (Central time), and is streamed live to the world. 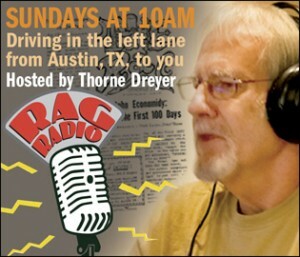 Host and producer Thorne Dreyer, who lives in Austin, also edits the progressive internet newsmagazine, The Rag Blog. Dreyer, a pioneering Sixties alternative journalist, was a founding editor of two of the era’s most influential underground papers — The Rag, in Austin, and Space City! in Houston. He was also an editor at Liberation News Service (LNS) in New York, and was general manager of KPFT, the Pacifica radio station in Houston. Tracey Schulz, a programmer at KOOP in Austin, is co-producer and engineer at Rag Radio. Although Rag Radio is produced for a national and international audience, it often taps the rich and storied tradition of Austin, Texas. Long a center for progressive politics and cultural iconoclasm, Austin was a birthplace for the psychedelic music phenomenon and the underground press and comix movements of the Sixties — and the University of Texas at Austin was a center for the Sixties New Left and resistance to the War in Vietnam. All Rag Radio shows are available as downloadable podcasts at the Internet Archive. We can be contacted at ragradio@koop.org. This entry was posted in National Programs, Programs, Rag Radio by Jake. Bookmark the permalink.